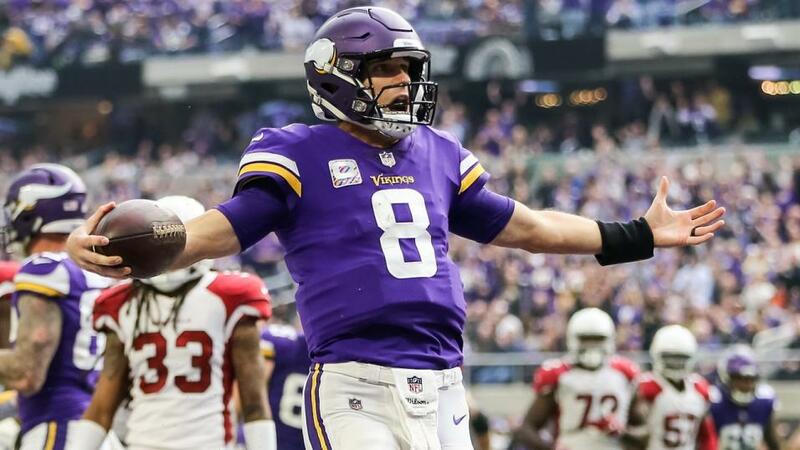 "Throw in the slow starts that New England has uncharacteristically gone through this season, and I can't see them holding the Vikes under 10 for the first half." There is some fine satisfaction when dogs win big, like the Cleveland Browns did in Cincinnati last Sunday. If you took the Browns on the moneyline you were golden, if you took them with the points you were silvered and well, if you did go under 46.5 and watched Baker Mayfield lay 35 on the Bengals, who managed 20 themselves in garbage time, well, consider the Giants and Eagles covering 46.5 by half a point the shiny bronze medal. That makes Tampa Bay giving the Niners 3 and winning by 15 extra; it must be the brass ring or something. Prizes for everyone! This week is looking like trap city, because of something called 'recency bias'. We have a couplafew teams on winning streaks, like Houston on eight, Indy on five and Dallas on three, and even the Bills and Browns on two, and there is the powerful temptation to go with the flow on those teams when situationally their match-ups might not be as favourable as first glance might suggest. Last night's game might have raised that spectre...Dallas' win over New Orleans on a 10-game win streak wasn't a huge shock, but the way they did it, and the 13-10 scoreline, certainly was. The thing about streaks is they have to come to ends, usually, unless you're the 1972 Miami Dolphins. But recency bias is a powerful factor. Of course there is another bias in play this week. Your starting quarterbacks around the league Sunday will include Cody Kessler and Jeff Friskel, joining five rookies, Nick Mullens, Colt McCoy and maybe Chase Daniels or even Josh McCown again if Syndrome Sam Darnold isn't fully fit. These are the wild cards in a game of snap. Call it Decency Bias. The Patriots/Vikings matchup is the most fascinating of the week, because the Vikings can be explosive offensively and devastating defensively, but they haven't been able to put the two together as often as they'd like; but note three of their four losses are close ones to good teams. The game this one resembles most is the tie in Green Bay against the Packers, and with Gronk and Edelman back and Sony Michel healthy the Pats are probably a more balanced offense. But the Pats are both vulnerable at the back and lacking in quality pass rush, which means Kirk Cousins could have time to hit his two top targets, Stefon Diggs and Adam Thielen, for points. Throw in the slow starts that New England has uncharacteristically gone through this season, and I can't see them holding the Vikes under 10 for the first half. On paper this is a close matchup, and that is the way it will probably play out. But the Steelers, despite playing an awful game in Denver last week, were still in it down to the final minute, when indecision about goal line strategy mixed with indecision on the part of Big Ben and their shot disapeared. The Chargers are actually better on the road (4-1) than the Steelers are at home (3-2) and I would certainly think this one a better value at three points, but I think this is the week they get James Connor back in gear and come out a touchdown better than the Chargers. This is the upset that intrigues me the most. You could take the Bucs with the handicap (+3.5 at 4/5) and I wouldn't argue but I think this one could be high scoring and the field goal might not be in play. Last week both teams scored 27 points, so the over (54.5 at 19/20) might be a nice one too. The Bucs beating a not very good San Francisco defense, the Panthers struggling against a good Seattle unit. Devin Funchess will still be out for Carolina, and Curtis Samuel is likely to join him, which leaves Cam Newton without many targets beyond Christian McCaffrey and rookie wideout DJ Moore. Jameis Winston is in the mode of playing for a contract of one sort or another, and the Bucs are actually sixth in the league in big plays (mostly passes over 20 yards). So if you like high scoring and maybe mistake-filled football try this.